Thank you to the 275 people who took the Welcome Christmas 2018 Survey. The VocalEssence staff analyzes the results and uses the information to plan for better performances in the future. Below is a summary of the results. 23% of attendees were attending their very first VocalEssence concert, and 32% of respondents attended VocalEssence concerts more than three times per year. 90% of people spoke with others about the performance after the concert. This indicates that the concert will stick with them for a longer time. A majority of people felt welcome at the performances. On a 1-5 scale for how welcome the audience members felt at the concert, 96% gave a score of 3 or higher, with 68% giving the highest score of a 5. We had a number of questions about the concert including questions about the new commission by Nico Muhly, commissioning in general, and choosing pieces for the concert. Please watch the video above to learn more. 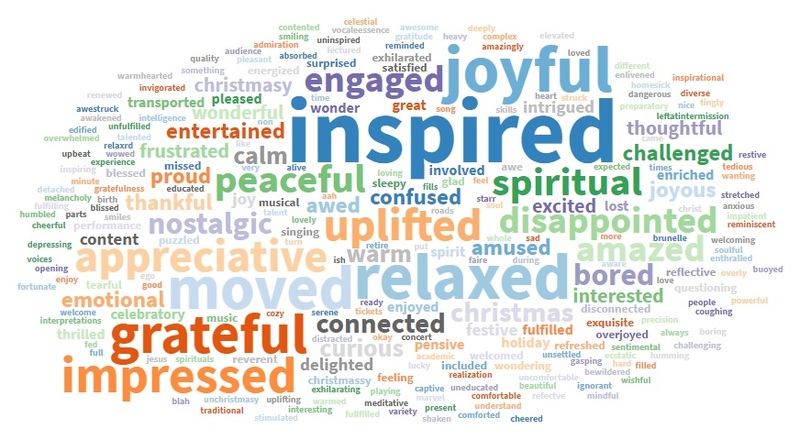 Below is a word cloud that includes the words that audience members used to describe the concert. The larger the word, the more it was used by survey respondents.